Located about 3 hours by vehicle from Mto wa Mbu (town nearest to Lake Manyara), this area is part of the famous Great Rift Valley of Africa. The area has the distinction of being incredibly dry and dusty. Surrounded by rolling hills and deep craters, the lake water is with a alkaline level close to that of ammonia. However, the adventurous tourists that venture here are rewarded by being truly off the beaten track and will be surrounded by some fabulous scenery. The desolation broken up by some scattered Maasai dwellings scattered here and there. Preceded by some small extinct volcanoes, you will come by Kerimasi Crater and Ol Doinyo Lengai (“mountain of god”), an active volcano rising from the surroundings. On the far side of Lengai, you will arrive at Lake Natron. 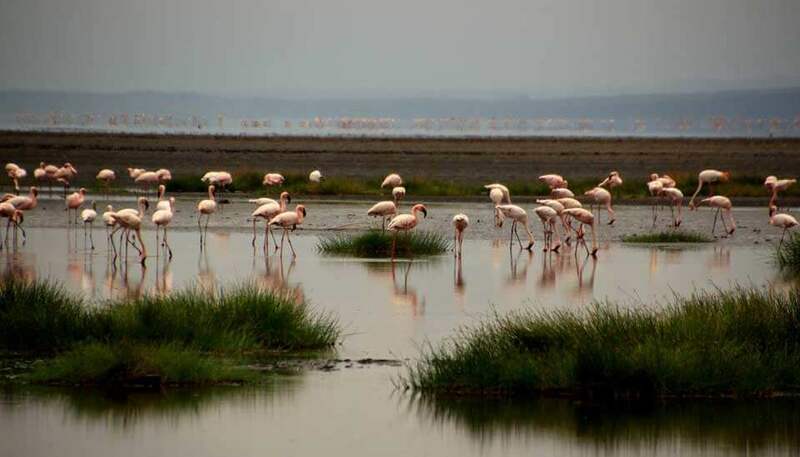 This highly saline lake supports many micro-organisms and a blue-green algae with red pigments which attracts a very large number of flamingos. There is an opportunity to walk up to the Engero Sero Waterfalls. This walk winds up through a shady gorge (very welcome in the heat) between steep cliffs. There’s a bit of gentle scrambling involved, and you’ll get a bit wet crossing the river a few of times along the way. However, after a few hours you’ll reach a beautiful natural swimming pool surrounded by steep rock walls – showered by cascades of spring-water and overlooked by palm trees. This hike is a great reprieve from the staggering heat and you will find the swim quite refreshing. Ol Doinyo Lengai is possible to climb. A midnight start is normally involved as a way of avoiding the heat. It is possible to arrive at the summit by sunrise and return before the temperatures climb too high. The best times to visit are the relatively cooler months of June – August.